Who wants to go kayaking? I do! I do! 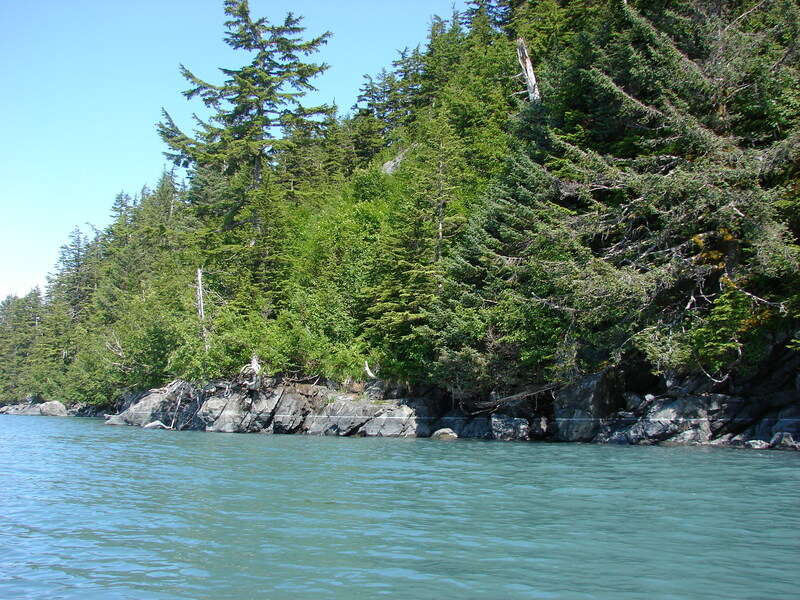 The short version: 3 days of paddling about 9 miles a day in 360 degrees of gorgeous. Humpback whales in close proximity. 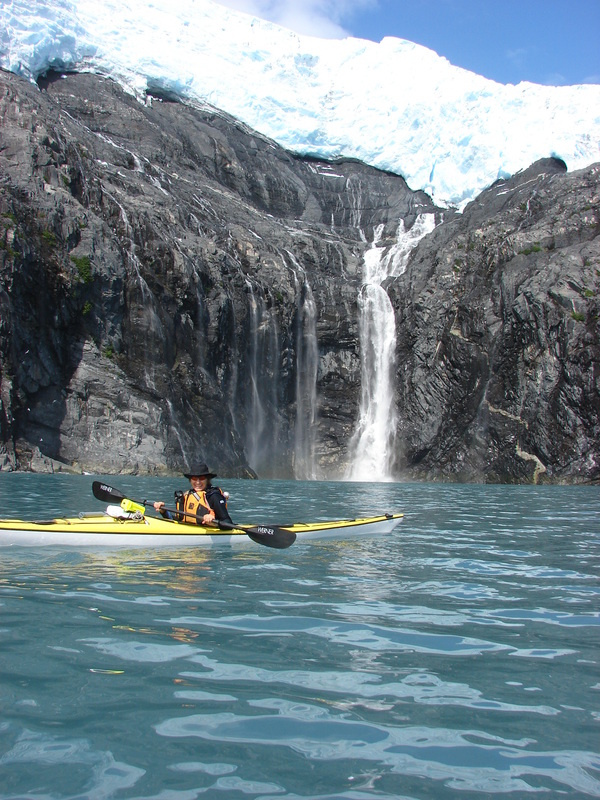 Glaciers and waterfalls galore. kittiwakes, Oyster Catchers, Pigeon Guillemots and other sea loving birds everywhere you look. Harbor Seals. Sea Otters. Sun. Rain. Choppy seas. Flat glass calm seas. Perfection. The long version: My friend Carol is a most experienced and knowledgeable kayaker who has offered to take me kayaking numerous times over the years. Though I have taken her up on her offer a time or two, I knew I had to go one more time before leaving on my Big Trip with Dora, so off we sped to Whittier with two boats and three days worth of gear. Before moving to Alaska, I hadn’t realized that we, the United States, had a secret deep water port in the North during WWII. Since the cat is already out of the bag, I can tell you that we did, and it was in Whittier, AK. How ’bout that? It was just in the last 10-12 years that the single lane train tunnel through the mountains was opened up to private vehicles allowing easier access to the small town and its harbor. As I was saying, Carol and I loaded up and caught the 9:30 tunnel to Whittier on Friday morning. Once in town we located Epic Charters (red marker on map) whom we had hired to take us, our boats, and our gear well into Blackstone Bay where we would begin our trip (green marker on map). The ride was about an hour or so and took us past beautiful scenery and multiple rafts of sea otters, each raft consisting of about a dozen otters and their young. Our drop off was Picnic Beach near the head of the Bay. 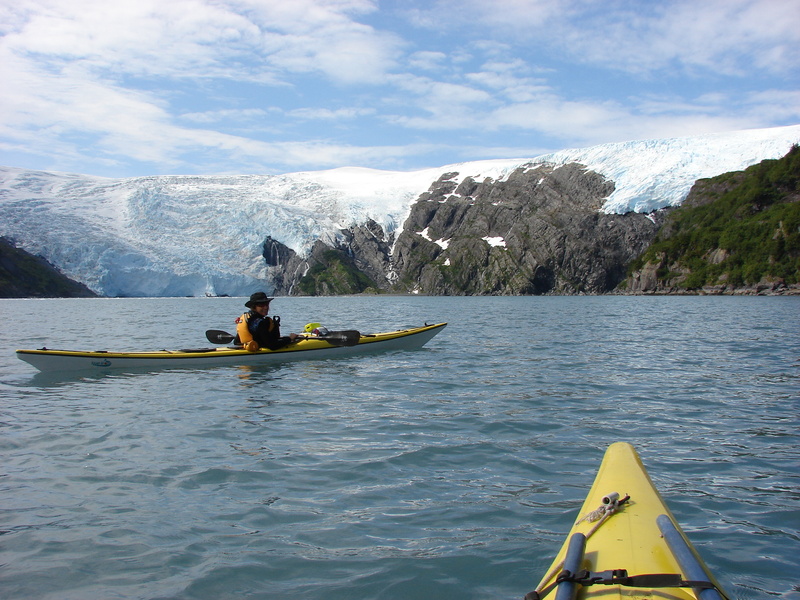 Once off the boat, we packed all our gear into our kayaks and set sail, so to speak, up Bay toward the Kittiwake Rookery, waterfalls, hanging glacier, and the tidal glacier that gives the Bay its name, Blackstone Glacier. If you look at the map, you can follow our progress from the green marker sort of in a counter-clockwise direction. I’m new at this map thing, so we’ll have to see how it goes. Click on link to view map. Blackstone Bay/Prince William Sound out of Whittier, AK Please use the zoom and directional functions on the map to your advantage. I was hoping to post photos at each map point, but can’t seem to figure out how to do that just yet. 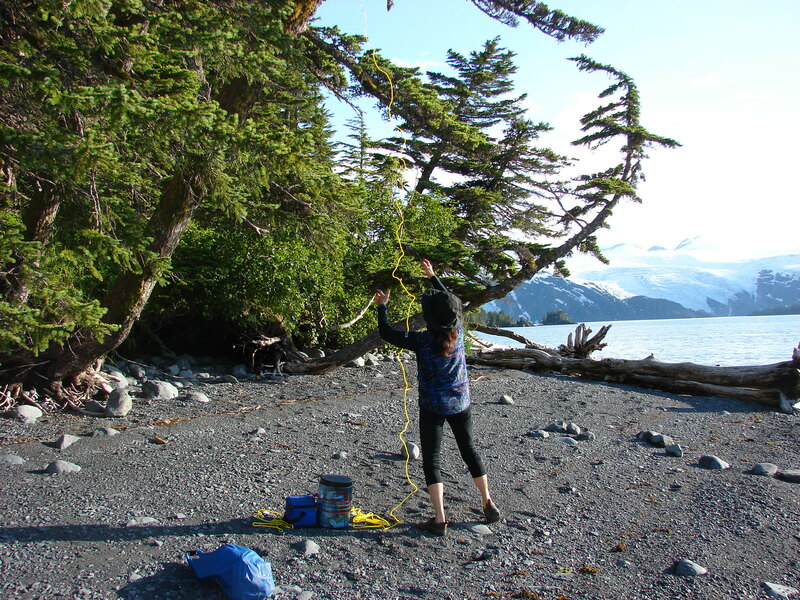 This is Carol on the way to the glaciers and the kittiwake rookery. You can see Blackstone Glacier on the left. It is a Tidal Glacier as it comes all the way down to the water. 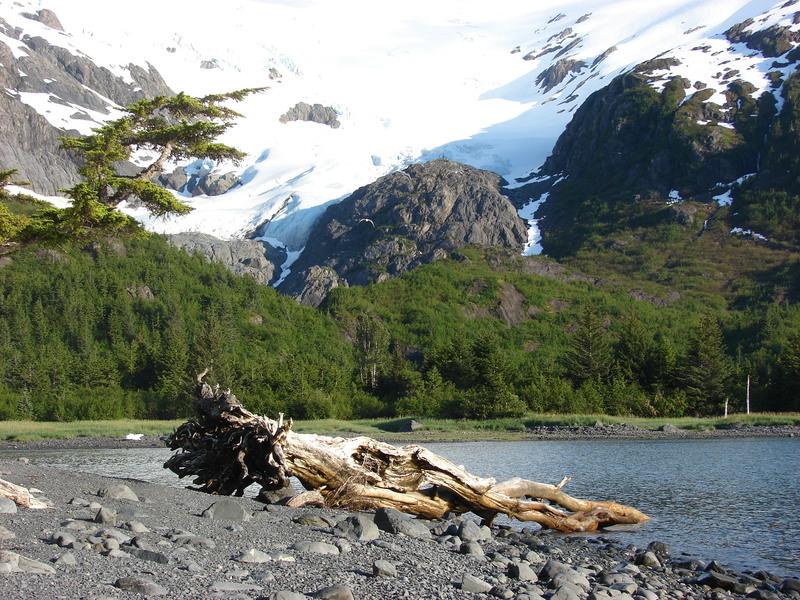 The glacier on the right is called a Hanging Glacier as it “hangs” off the mountain up in the air. Carol in front of the Hanging Glacier and its powerful runoff waterfall resulting from its rapid melting. 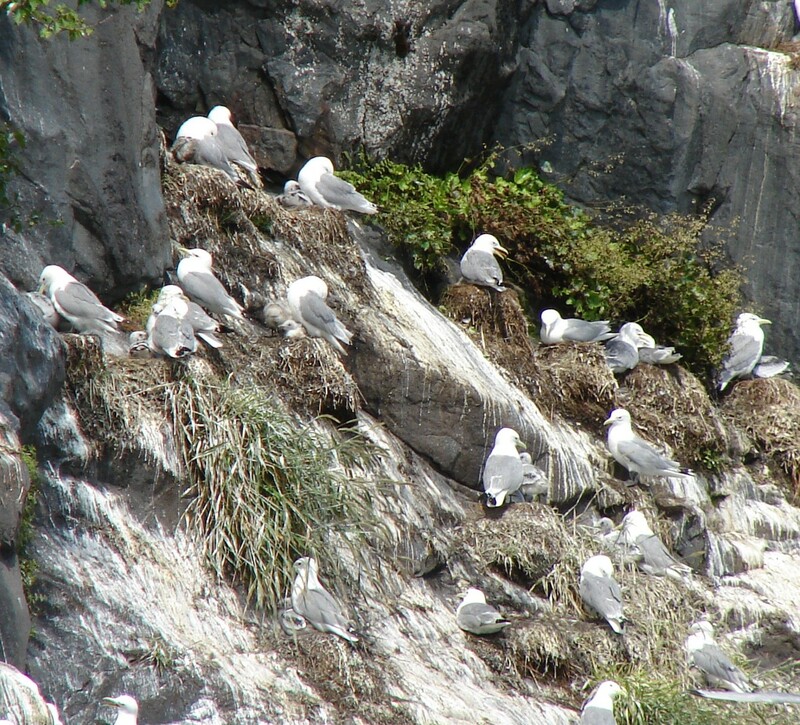 Kittiwakes are a type of small seagull and one of their many nesting sites, called a Rookery, is located to the right of the Blackstone Glacier. You can tell a Kittiwake by their black wingtips. See photos below. In addition to the many visual sensations were the audible sensations, and overriding the crashing water from the falls and the constant cries of the gulls, was the sound of a moving glacier. Think of a summer thunderstorm in the South. First the crack of lightning followed by booming and rolling thunder. This is precisely what a glacier sounds like as it creaks and moans its way downhill. After quite a while paddling around this area, we decided it best to get a move on since we had a number of miles to cover, so out through the iceberg and seal ridden water we did go. Did you know that ice in sea water sounds just like a bowl of rice krispies in freshly poured milk? Well, it does, so we paddled through the rice krispy ice and on around to the east side of the Bay and headed north toward 17 mile beach, which we hoped would be our campsite for the night. Here are some shots taken along the way. 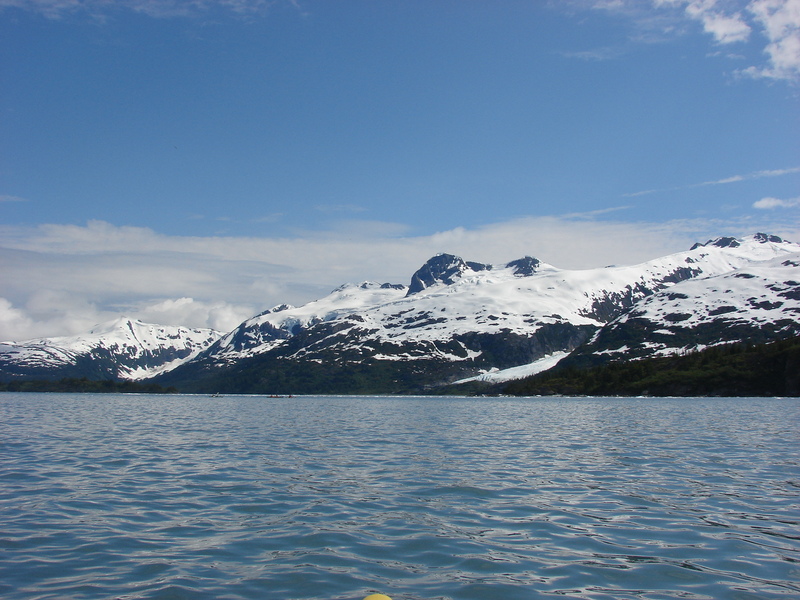 This first shot is the view looking up the bay from Blackstone Glacier. The high tide mark through here looks like someone drew it with a ruler and a piece of chalk. 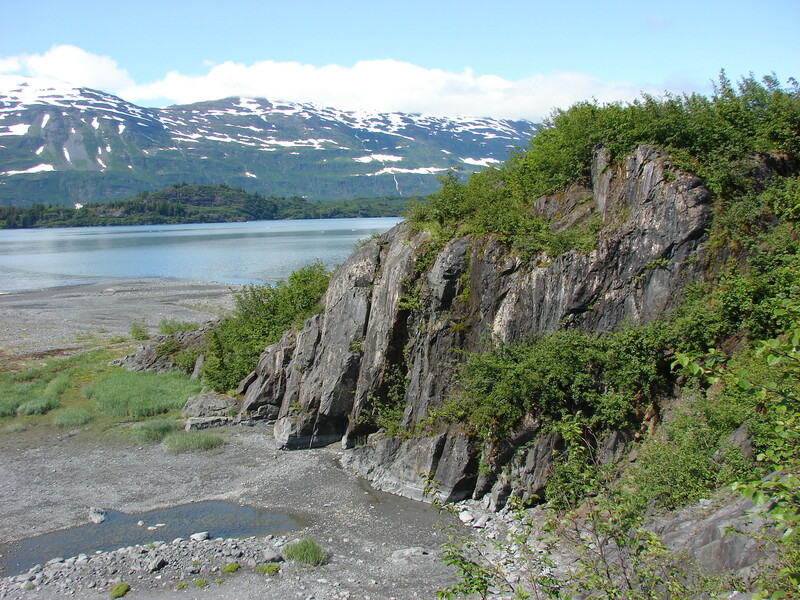 This is where we got out to do the Earthcache at Lawrence Glacier. 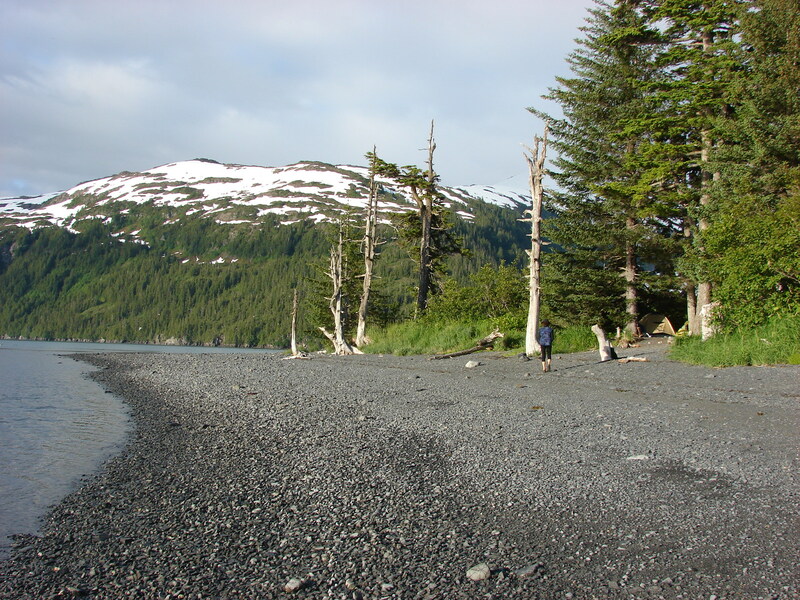 At about 5:30, we landed on 17 mile beach still hearing the boom of the glacier in the distance behind us. See if you can see one of our tents peaking out of the woods. Carol attempting to bear proof our food by hanging it for the night. 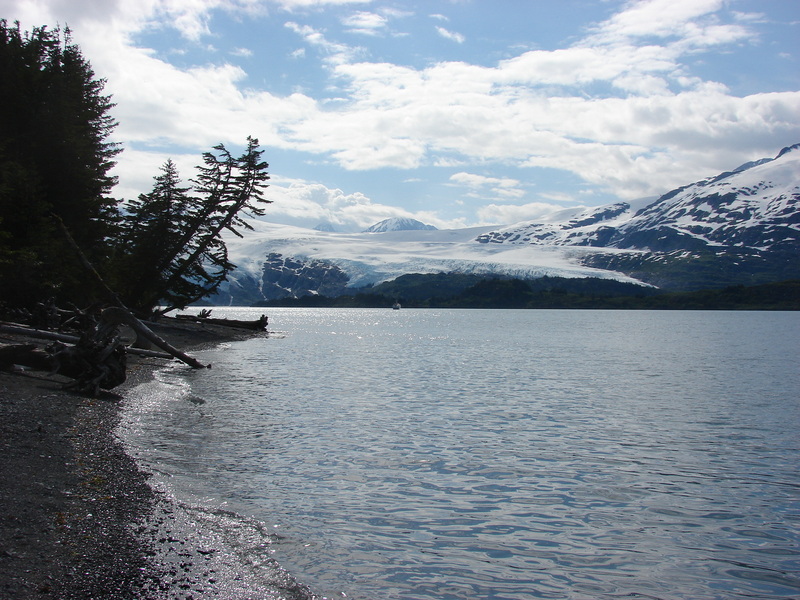 A view back at Blackstone Glacier from 17 mile beach. The beach was littered with “Alaska-style” driftwood. We set up camp, cooked dinner, and explored the area all the while ignorant of the fact that we would soon be joined by four adult humpbacks as well as a baby who would stay with us, just off shore, all night and into the next day, so stay tuned. Oh my, the map is an amazing addition and with the pictures following, it is almost like I now am familiar with the area. HOW GORGEOUS and how lucky you are to have this adventure. You have the life my friend! Great pictures! You need to find a way to make this blog pay!! I enjoyed your blog, as always. 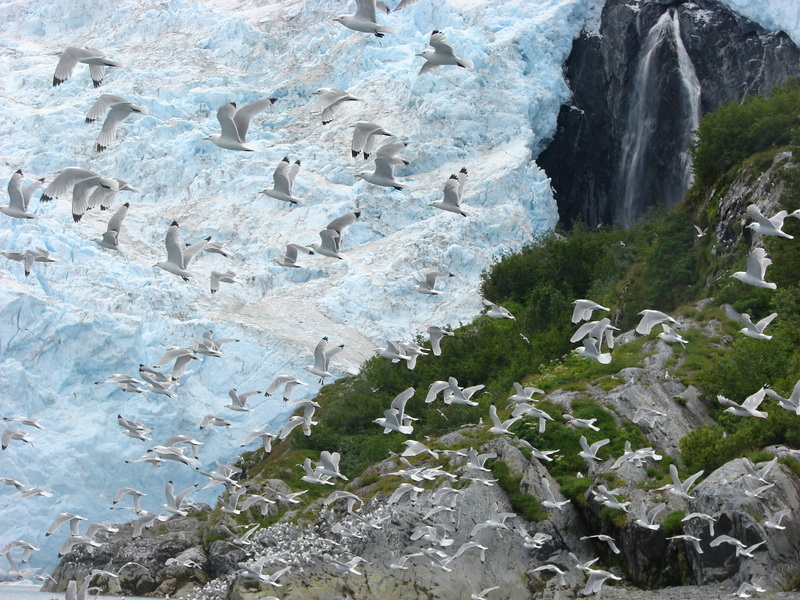 I really love the photo of the seagulls in flight in front of the glacier. Can’t wait to continue the journey.